Former Alaska governor has earned roughly $12 million since stepping down from her job as Alaska governor at the end of July, according to a "conservative estimate" on the part of ABC News. Palin had been making $125,000 per year as Alaska's governor. The controversial 2008 Republican vice presidential nominee was reportedly paid $7 million for her book "Going Rogue," mostly after she stepped down. She is said to be getting $250,000 per episode for her television series on the Learning Channel and charge up to $100,000 deliver a speech, which she does regularly. ABC News writes that Palin's earnings are "probably much higher" than $12 million since she left the governorship, "but is hard to quantify because Palin does not publicize her earnings." She has not disclosed what she is being paid by Fox News to serve as a contributor or her earnings from her planned second book. 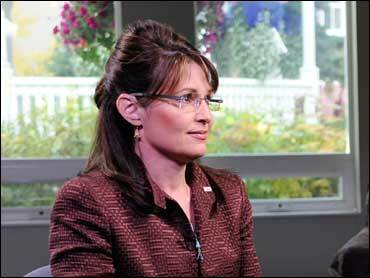 Asked about Palin's earnings, an aide told ABC News that she "is now a private citizen. As a result, her fees and earnings are private." Palin's contract for a June speech at California State University, found in a campus trash bin by students, dictates that she gets "first-class airfare for two and three rooms at a luxury hotel" for a speech in June, according to the Associated Press; her lectern must also be stocked with water bottles and bendable straws.